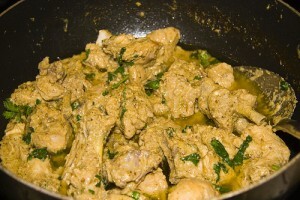 Chicken White Karahi recipe by rakhshishah at DesiRecipes.com. dont like tomato in your food no problem, this yummy chicken karahi recipe wont let you feel that something is missing. In a pan take oil. Add chicken & fry till color changes. When little water is left, add green-onion (leave some green part for later use). Mix green chillies & ginger slices. Beat curd & mix garam masala powder, black pepper , white pepper, salt & mix it in chicken . Mix left over green-onion , more ginger slices. Sprinkle 2-3 tsp fresh cream if you like. Take out in a bowl. its a good racipe.i like it.iwill try it.yummy yummy. i have tried it it was too good and tempting ......thanks for providing such a good recipe. have yet to try but im sure its good .